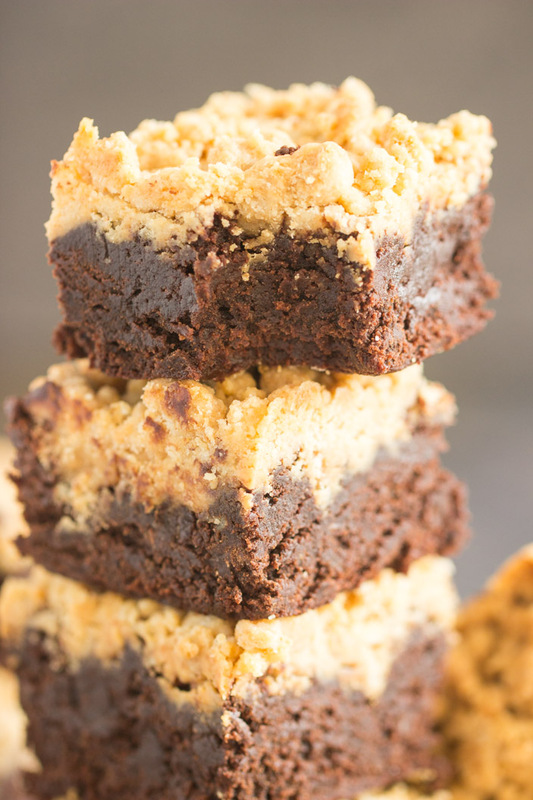 Peanut Butter Streusel Brownies – the most perfect, rich, moist, insanely chocolatey brownies, tall and thick, swirled with melted peanut butter, and covered in sweet, crunchy, melt-in-your-mouth peanut butter streusel! 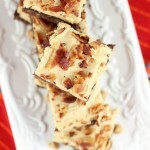 These Peanut Butter Streusel Brownies are an instant classic! 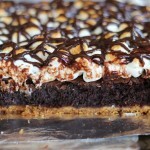 Possibly my most favorite brownie recipe to date. 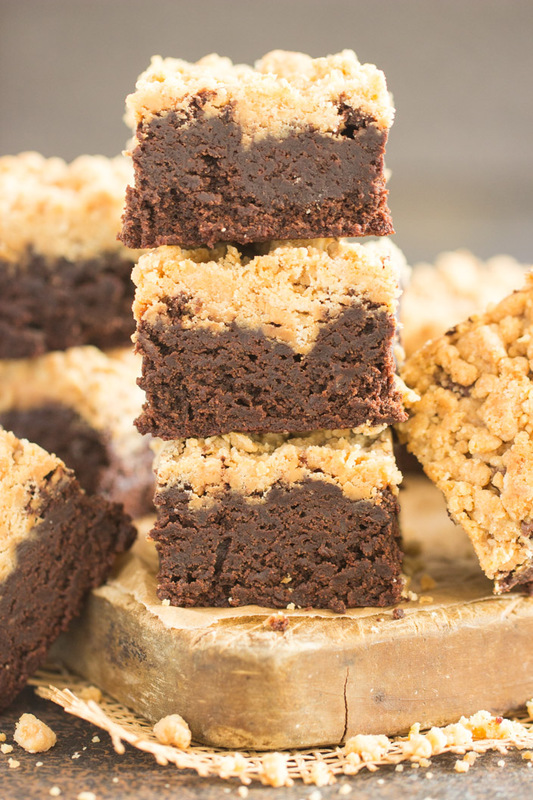 I’m not saying that these Peanut Butter Streusel Brownies are my ‘best’ brownie recipe to date because I’ve got a lot of really fantastic ones, but I do think these are a personal favorite. 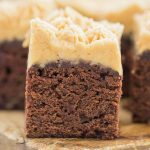 I’ve just never seen anything like these, and the unique twist on these Peanut Butter Streusel Brownies was an instant homerun for me! 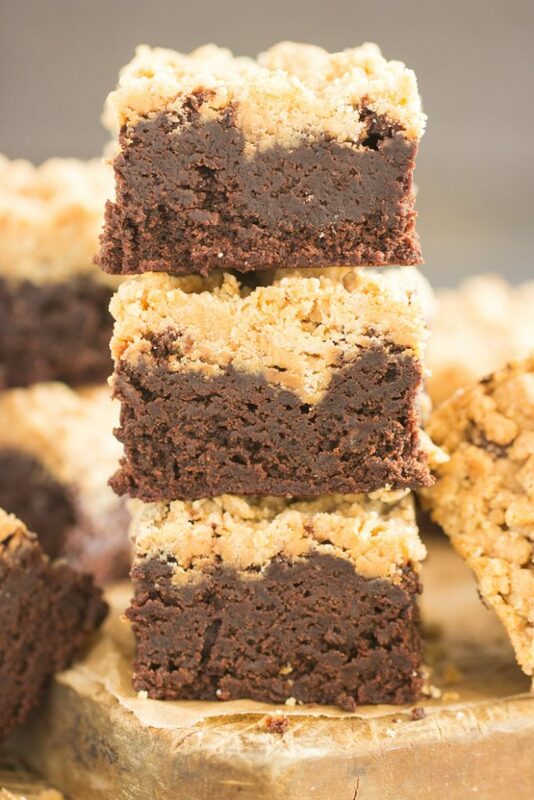 I used my favorite basic brownie recipe – it’s the same brownie batter that I use in these Nutella Brownies with Nutella Buttercream, these Ultimate Fudgy S’mores Brownies, and even these Peanut Butter Banana Brownies (loosely based). 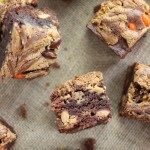 Why does that particular brownie recipe rock? Because they’re super thick, mega moist and fudgy, and supremely chocolately. They’re as rich as a brownie can get. Taste and texture aside, they’re also a breeze to whip up. You don’t need a mixer, and you can definitely get these put together in just one bowl. Minimal work, minimal clean-up, and maximum decadence. I’ve tried a lot of brownie recipes, and I come back to this one over and over again. My brownie recipe is foolproof – anyone can make them and they turn out perfectly every time! – and it’s also extremely adaptable. 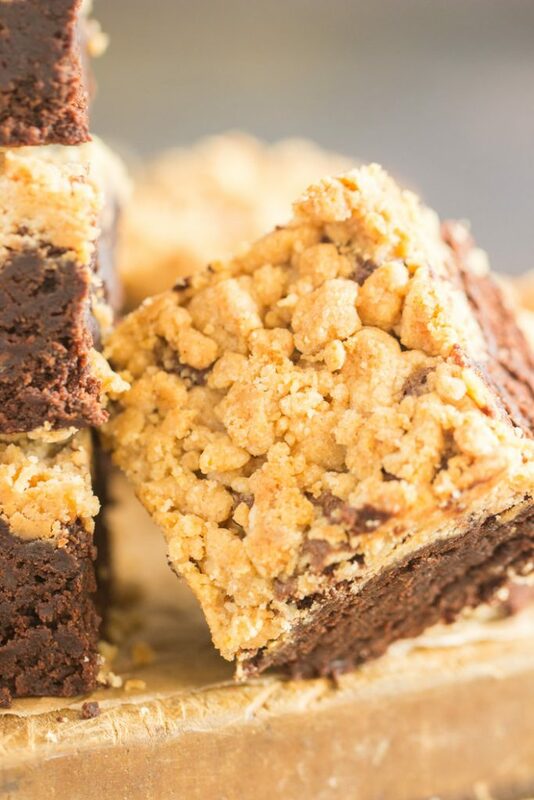 For this Peanut Butter Streusel Brownies recipe, I just prepared my staple brownie batter, and swirled a good portion of melted creamy peanut butter on top. Over the peanut butter swirl, I piled on a heap of peanut butter streusel. Peanut butter streusel is life-changing. Streusel usually has the same basic ingredients, like butter, brown sugar, sugar, and flour. Instead of using all butter, I substituted most of the butter for peanut butter! That equals: peanut butter streusel. YAY! It turns out exactly how you want streusel to be – crispy on the edges, but the little morsels melt in your mouth. In this case though, they taste like peanut butter. Isn’t that wonderful? 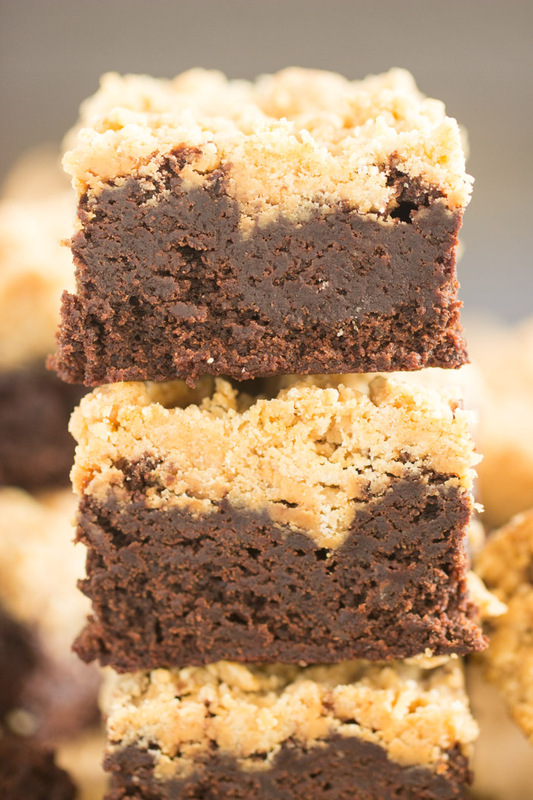 You’ll adore these Peanut Butter Streusel Brownies. 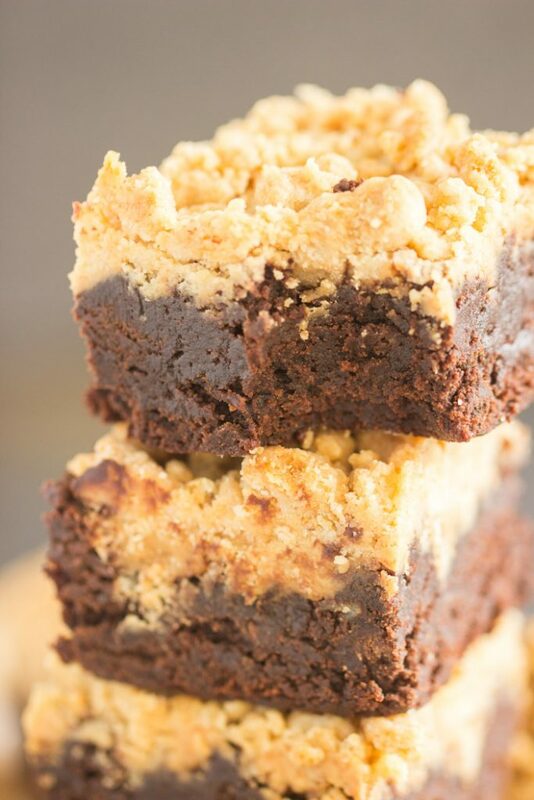 The most perfect, rich, moist, insanely chocolatey brownies, tall and thick, swirled with melted peanut butter, and better still, covered in sweet, crunchy, melt-in-your-mouth peanut butter streusel! You’ve probably never seen another brownie recipe like this, and now that you’ve found it, you’ll never look back. I’m sorry. I see where it says 9 inch square pan. How can you get 25 servings out if a 9 inch square pan? Usually you get that many out of a 9×13 size pan. I cut them in 5 rows of 5 – I made them smallish because they’re very thick brownies and they’re very decadent & rich. Large brownies might be overkill. It’s just a suggested serving amount, but you can cut them any way you’d like, obviously! Could this be doubled for a 9×13 pan? I would use two 9-inch (or even 8-inch) square pans if you’re going to double it! I think doubling them for a 9×13 would still have them be VERY thick! They’re pretty thick in a 9×9 as it is! It’s probably doable, but you’ll need to bake them a good bit longer for the center to set. 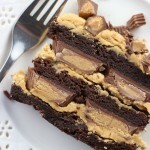 This peanut Butter brownie streusel looks so good. Are you suppose to melt the butter and the peanut Butter for the streusel part?